How do you like your eggs? Over easy? Sunny side up? How about rolling down the road? That’s the egg you get with today’s Nice Price or Crack Pipe Previa, and we’re going to find out if its price makes it a breakfast special. “Is it soup yet?” was an ad slogan brandished by desiccated victuals maker Lipton Soups way back in the ‘70s. In the ads, this was always directed at a mom by some whiny-assed kid who apparently couldn’t even bother the simple task of emptying his own packet of sad noodles and shriveled approximations of vegetables into a plain cup of hot water. He didn’t need soup, he needed a smack up side the head. The general consensus yesterday was that our 1987 Ford Thunderbird Turbo Coupe wasn’t “soup yet” meaning it hadn’t yet reached a point of age and rarity where it might rate being worth its $9,700 asking. That resulted in an overwhelming 78-percent Crack Pipe vote, our second loss for this holiday week. Let’s see if we can cut that streak shot, okay? Here’s a question for you: when was the last time the Toyota Motor Company offered the American car-buying public something that was truly unique and interesting? It’s been a Procyon’s senescence hasn’t it? Nowadays it seems they’re giving us mostly just hybrids and crossovers, with a few hybrid-crossovers thrown in as their way of shaking things up. Once upon a time, the Japanese giant built a number of weird and wonderful cars, and as evidence of that, here we have exhibit P: a 1991 Toyota Previa minivan. Okay, first off, this isn’t your mom’s minivan. That is, unless your mom drove a Previa, in which case she’s probably the coolest mom ever. She probably also has a tattoo somewhere private that she never told you about. Don’t ask her though, that would be weird. 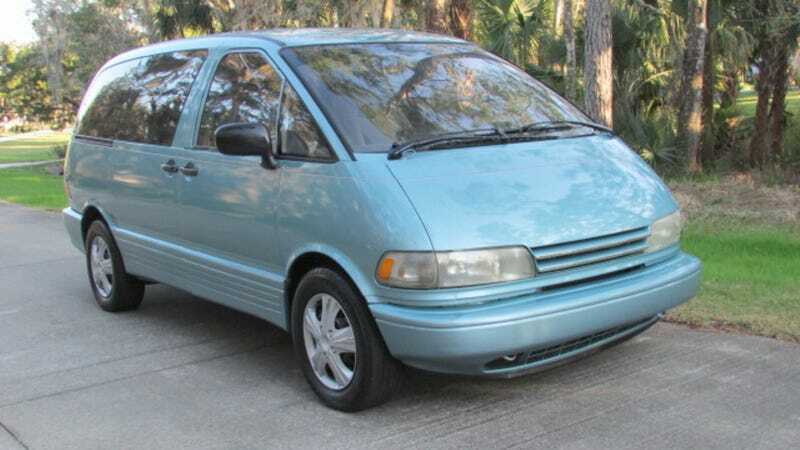 What makes the Previa cool is that it’s a mid-engine minivan. That’s right, just like a Lamborghini Aventador or McLaren Senna, the Previa keeps it’s mill hunkered down and between the axles. Not only that, but the 133-horsepower 2TZ-FE four under the floor lies canted over on its side with the sump housed immediately below its sideways bores. All the major ancillaries are carried remotely under the hood, and are powered via a “Supplementary Accessory Drive System (SADS), which is totally not sad. That drivetrain layout ensured a flat floor and absence of a doghouse for the engine, which together meant a sizable amount of space inside. That was all wrapped in one of the eggiest shapes ever offered, the work of Toyota’s CALTY design studio in sunny California. This 1991 Previa lacks the two options that make it even more interesting—the five speed manual gearbox and supercharger for its four. The stick is a rare duck these days, and the blower wasn’t offered until the ’94 model year. That was in response to the competition which had started moving to V6 engines in their vans. Neither of those two delicious options were ever offer together here, however. Still, there’s a lot to like with the standard Previa, and this 168,000-mile ovoid seems to be a fantastic example of the species. The metallic blue paint appears to be a re-spray as that doesn’t look to be a factory color, and these were never offered in mono-hue form. Originally, the plastic bumpers and lower cladding would have been in charcoal, and there would have been a black strip that encircles the car just below the windows and up both A pillars to lighten the shape. I kind of like it like this, however I think I would like to see a return of the black accents. I’d also prefer alloys over the steelies with plastic Pep Boys wheel covers. That’s just me though. The ad describes the van as being in “super condition” with a “spotless body” and an interior that’s “as close to immaculate” as you could conceive. The pictures seem to bear this out. The three rows of seats come with the iconic blue stripe trim and the last row will fold up into the sides which is pretty cool. It’s claimed to run without any issues and being a Toyota from the early ‘90s, why would it be otherwise? Here’s the kicker for this Previa—its price is a mere $2,999. Okay, so maybe that’s a shocker for you rather than a kicker. Now that I really think about it, getting kicked or getting shocked both sound pretty undesirable so maybe we should just move on and see if you think this Previa is worth that kind of cash. What do you say, does this egg engender hatching a plan to pay its $2,999 price? Or, is that price a total yolk? Spacecoast, FL, Craigslist, or go here if the ad disappears. H/T to PaulR on the Twitters for the hookup! Would You Blow $9,700 On This 1987 Ford Thunderbird Turbo Coupe?